One of the many neighborhoods of Los Angeles, Compton holds legendary status as one of the birthplaces of hip-hop. Represent for Compton with this cool black straight brim hat. 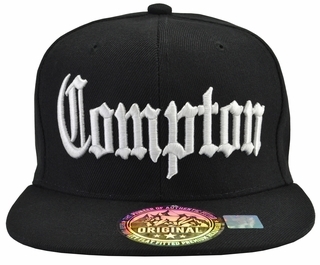 Quality embroidered with Compton in white letters on both the front and the back. This hat is one size fits all with an adjustable snap back strap. Be sure to get yours soon before were straight out of stock. Made of 100% Acrylic.